Depart from San Jose accompanied by a bilingual naturalist guide for a pleasant journey to Tortuguero National Park, after a scenic drive by the Braulio Carrillo National Park, there will be a stop for a typical Costa Rican breakfast. Estimated Departure from San José: Between 05:30 A.M. – 06:30 A.M.
As we leave San José towards the Caribbean side of Costa Rica, we head into the mountains of Braulio Carrillo National Park, where steep slopes are covered with thick cloud forest and beautiful waterfalls can be seen from the road. After crossing Braulio Carrillo, we will enjoy a delicious Costa Rican typical breakfast. Then we continue to a Banana Plantation, where your guide will explain the process of growing and exporting this fruit. Continue later towards the embarkation dock, we will embark on the most exciting part of this tour: the boat trip into the jungle of the Tortuguero National Park. Covering 29000 hectares. Tortuguero is one of the most important nesting sites of Chelonia Midas, the green sea turtle. 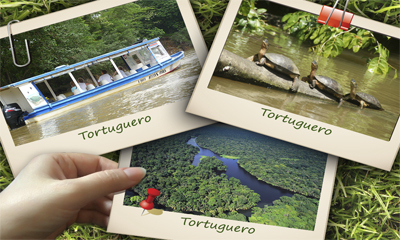 Tortuguero’s forests and waterways are home for many endangered mammals such as sloths, monkeys, agoutis, coatimundis and manatees. There are also abundant birds, such as toucans, trogons, egrets, herons and aninghas, as well as crocodiles, turtles and countless colorful butterflies, including the blue morpho. You will enjoy a hearty typical buffet lunch to please the hungriest of appetites. After lunch you will take a walk through the Tortuguero Village, where you will have the opportunity to learn about the history of the town and its inhabitants. Returning to the bus, we head back to San José, making a rest stop along the way.